I am currently preparing a MA course in social media that I am going to teach this fall at my department. I want it to be a course that integrates theory with practice and tries to shy away form the usual marketing and business-related talk around social media (I guess the students will find out this stuff sooner or later anyways). For the practice component one of the things that I have been thinking about is blogging. As I have searched the web for similar courses and the use of blogging in the classroom I’ve encountered a lot of different approaches and possible assignments. I thought I gather some of the discussions here and post a couple of the tips & experiences that I have found. The hub-and-spoke model, where students maintain their own individual blogs that aret connected through a hub blog that I’d set up for the class. One central class blog that is collaboratively produced by the students and me. I’m still somewhat undecided about which model that I am going to use. First I thought about going with the hub-and-spoke, as it would allow each student to get familiar with and explore the blog software of their choice and to choose their own themes and designs. But after I’ve checked out a few graduate and undergraduate courses using this kind of approach, I quickly realized that most of these individual blogs are not very rigorous nor do they seem to ”survive” the course. There are lots and lots of individual deserted blog islands out there, with only a handful of half hearted blog posts. It is not difficult to see how many of these blogs only seem to simulate a teacher-student assignment/grading relationship. The hub-and-spoke model also makes it less likely that students will actually read and comment on each other’s blogs. Nate Kogan Preparations for a Blogging Plebescite? Yes, people still blog, at the same time blogging does seems a bit passé in light of all the glitzy new stuff that continues to surfaced on the social media horizon. However, blogs and blogging constitute something quite foundational and important in terms of social media. 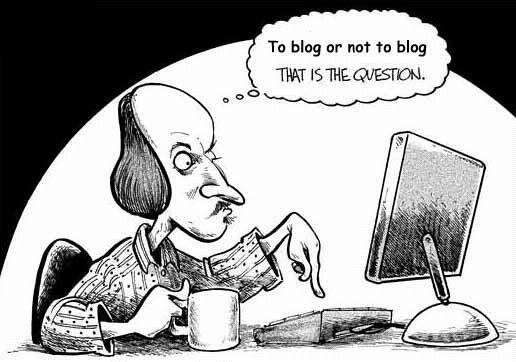 Blogging is all about self-presentation, different communication genres and modes of writing (combining both process writing and presentation writing), networks and linking practices, immediacy, the opportunity to be published and have a say in the public sphere, sharing online content and participating in a conversation. Not only is blogging a great way to learn about some of the core concepts involved in social media, but blogs are in many cases still one of the preferred publishing platforms of the commercial as well as public sector and thus an important part of the communications jobs that many students aspire to land after finishing their education. Quite often the blogging guidelines that I have come across encourage the students to pull in outside resources in their posts: links, videos, articles, etc. The purpose of letting students blog would be to use it as an ongoing publishing platform for reflecting upon and expanding on the contents of the class. The blog posts should strive to be thoughtful and reflective, raising additional and new questions in terms of the topics discussed in class, rather than just being descriptive or summaries. → Another way of using blogging that I have seen instructors use quite often is to provide a prompt for a weekly blogging assignment. For instance, one could prompt students to find an interesting source/link online and discuss it in terms of the readings and knowledge acquired in class. Or, encourage students to choose a debated topic within the social media landscape and take a position. you will make a post that serves a community of interest by directing attention to a worthwhile resource on the Web via an annotated link, including short, salient quotes, and explaining why your selected resource is worthy of attention by this community — the co-filtering function of blogging. construct a post that links to two or more websites and explain the overarching idea that connects the sites you select — connective writing. engage in online critical public discourse by analyzing the content of a site you link in a blog post, asking probing questions about the assumptions, assertions, and logic of the arguments in the site you link to. construct a post that takes a position on an issue, using links to other relevant websites to support your position. First Readers: These students are responsible for posting initial questions and insights about the day’s material to the class blog the day before class meets. Respondents: Students in this group build upon, disagree with, or clarify the first readers’ posts by the next class meeting. Searchers: Students in this group find and share at least one relevant online resource. In addition to linking to the resource, the searchers provide a short evaluation of the resource, highlighting what makes it worthwhile, unusual, or, if appropriate, problematic. The fourth group has the week off in terms of blogging. In the last 10 minutes of class, ask your students to sit down and write about the most important thing that they learnt that day and publish it straightaway.Another assignment is to let students search online for some of the core terms discussed in class and post the best descriptions that they find on their blog, reflecting on why this link/definition/resource seems useful to them (and others). This helps them research terms and find links. In order to interact with others’ writings students should be prompted in class to comment on other people’s blog posts to get the conversation going. Another issue to take account of is whether to write public blogs or make them password protected. I guess there are diverging opinions on this one as well, but I think Rettberg has a good argument when she says that writing publicly equips students to deal with the realities of the networked world (accountability, responsibility, publics, etc.) and to encourage them to reach out to others as well. Last, but not least the questions is: How to actually evaluate and grade blog posts and comments? I think that rather than reading and evaluating every single blog post that the students write, a better and more efficient way would be to let them pick four blog posts for assessment themselves at the end of the term as part of a portfolio. The portfolio could also include a list of links of comments on other students’ blog posts. In order to circumvent the possibility of students only writing a set of blog posts at the end of semester for the sake of credits, writing no more than one weekly blog posts could be a way of organizing the rhythm of blogging. Probably the best way it to rate the individual posts on some form of scale like the one used below by Mark Sample in his many classes using blogs. See for instance his Post-print fiction class. Posts must be relevant to the subject of social media in some fashion, and consist of at least four full paragraphs. They should preferably relate to that week’s course content, but in any case the topic should apply to the class in a clearly evident manner. Each post must contain at least one external link, properly formatted (meaning that the “http://…” should not be visible to blog readers–use appropriate anchor text). Your contributions will be graded on content, writing, and originality. Correct use of sources. Does the student refer to the readings or others sources from the web? It this done in an orderly and correct fashion using links? Originality and reflectivity? How descriptive is the blog post, or does the student also offer additional and perhaps alternative perspectives in order to contextualize the topic? Is there an argument? Is it evaluative? Does the post present any new ideas? Does the student participate in a broader conversation? Is the post a commentary on other students’ posts, and does it provide links to others’ blog posts? Does the student enage in a discussion with his or her fellow students, for instance by commenting their comments? You choose three blog posts that we will carefully read, but we will also evaluate your blog as a whole. You have to blog a minimum of 10 times. Does your blog show a consistency in blogging? Do the blog posts show an overall engagement with the course material?